Web Design Services, ECommerce Websites, Online Marketing & Mobile App Development With Guaranteed Web Visitors. Websyms design, develop & market your Magento ecommerce based business providing a 360degree solution for your business. We create Custom Shopify apps & themes and earned a perfect rating as a Shopify Expert with uncountable satisfied customers. We deliver a highly innovative and interactive BigCommerce store that influences your customers to take positive action. We provide custom WordPress solutions and services including design, development and consulting at very economical prices. We are experts in IPhone application development, from conceptual design to implementation, quality support & maintenance. Our certified IPhone developers transform your ideas into feature-rich IPhone solutions with interactive & personalized features. We have proven expertise in Android apps development that ensures value-added services to your mobile operations. 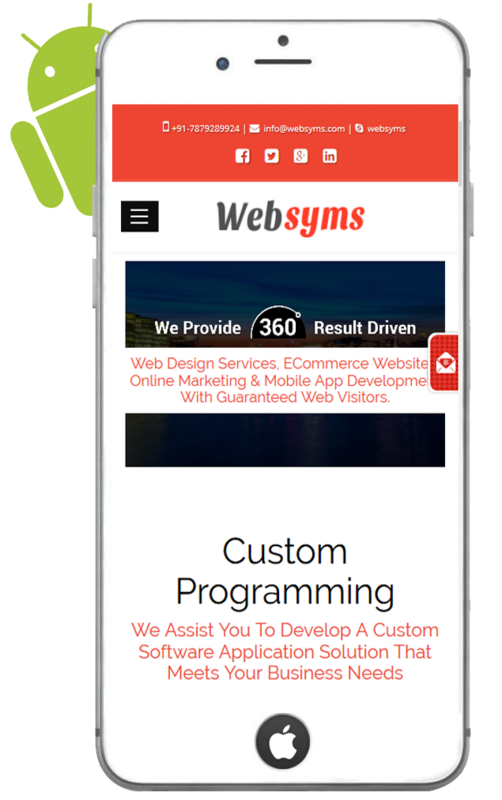 Our programmers are dedicatedly develop highly robust and scalable android mobile applications and porting to different mobile platforms. Our expert team is all set to assist you.